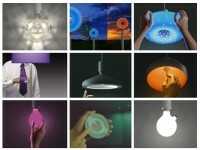 The Chameleon, a lamp shade that changes to match any color you ‘show’ it. The shade of this apparently traditional floor-standing lamp can match any color ‘shown’ to it. When the build-in sensor detects a color, the fabric of the shade replicates it precisely. As simple as pointing to what you want, Chameleon offers an intuitive method of matching colors. Chameleon’s integrated sensor scans the color your place before it, and the shade changes to that color, while the actual lamp light remains white, thanks to an advanced double light source, A traditional light bulb at the center provides white light above and below the shade. But a ring around that bulb projects changing colors into the shade while, at the same time, preventing the white light from diluting the color being projected.